Argos has launched a new TV advert, highlighting that, at Argos, you will find uniforms and everything kids need for back to school. 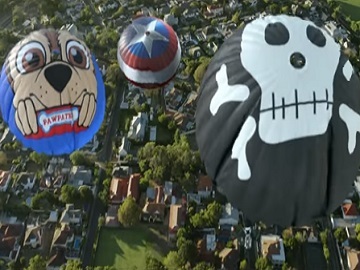 The 30-second spot, titled “Operation School Run,” features a dad flying a double rotor helicopter above a city and a mom having her three children, two boys and a girl – ready for being dropped at school. After asking them to adjust their clothes, making sure they all have their backpacks on, and giving them the other items they need, such as lunch bozes and musical instruments, she greets them as they jump out of the plane. When they are all in the air, she realizes one of the kids forgot their science project and, without hesiting, she grabs it and jumps after them. “Uniforms and everything they need for back to school. With Argos, you’re good to go,” the voiceover says at the end of the advert, which features school bags, character bags, lunch boxes, and, of course, uniforms for boys and girls and school shoes. The British catalogue retailer also informs that you can now shop or pick up Argos products at hundreds of Sainsbury’s stores across the UK. Customers can now save 20% off all Homewares when they spend £25 or more using the code HOME20 and up to £50 on selected Chromebooks for work, study and play.